ALLERGIES: Treatment of allergic conditions including some allergic reactions to drugs, urticaria, contact dermatitis, and allergic reactions to insect bites and stings. UPPER RESPIRATORY TRACT: Relief of excesive secretion in the upper respiratory tract as a result of hayfever and allergic rhinitis. NAUSEA AND VOMITING: Antiemetic in vomiting of various causes, including post-operative vomiting, irradiation sickness, drug induced nausea, and motion sickness. SEDATION: For short term use on the advice of a doctor or pharmacist. 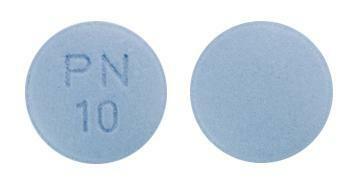 Circular, film-coated biconvex tablets with bevelled edges, pale blue in colour, one face impressed 'PN' above '10', the reverse face plain. 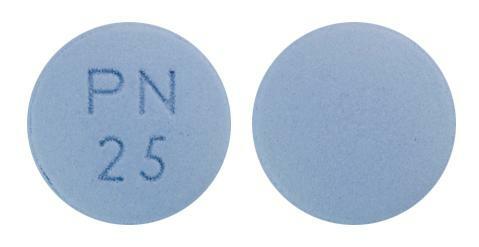 Circular, film-coated biconvex tablets with bevelled edges, pale blue in colour, one face impressed 'PN' above '25', the reverse face plain. Here is some practical and reliable advice about giving your sick infant or child medicine, including what is the right dosage and possible side effects.